Jordan wants to live in a world where physical and fiscal well-being comes easy, and where work/life balance is, well, balanced. He has been enamored with the idea of population health and chose his graduate education based on how he wanted to contribute to the wellbeing of the communities of North Carolina and beyond. As a project manager in health care he worked to keep momentum and creativity abound in the areas of Primary Care Leadership and Care Process Models. Designing strategic plans and helping weave the lattice of one amazingly influential health care company were his favorite accomplishments before leaving to work full time in fitness. 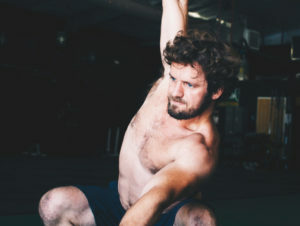 CrossFit helped Jordan to become more focused as a professional. He has shifted his focus of improving population health from an administrative position to direct influence in chronic disease management/prevention. As a coach, he keeps the mood light hearted while encouraging athletes to request more of themselves. He believes in the benefits of functional movements preformed at high intensity, practices the content daily, and expresses a true knowledge in movement patterns and mixed modality training. Jordan wants to be remembered for contributing and being one of the people. When he’s not coaching, working on growing the Asheville City Soccer Club, or working on ideas for increased community impact, you can find him exercising, reading, sippin’ stouts, or cooking ridiculously full flavored meals.